Chatbots generate a lot of hype and a fair bit of controversy as they make their way into the marketplace. 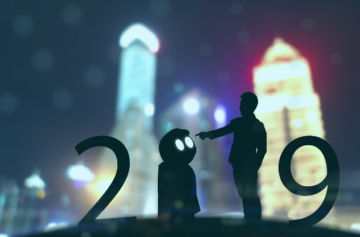 But what cannot be denied is their impact in some key use cases and chatbots are an increasingly important tool in any businesses customer communications strategy. These are the best reasons to use or adopt a chatbot, and highlight how they can benefit your organisation. Your customers or clients often need a little bit of help. Faced with actually talking to someone with their silly query, many look online for help instead. A chatbot is rapidly becoming the agent of choice to provide an instant answer rather than having people dive into a knowledge base, FAQ or showing them a PDF of the manual they already own. 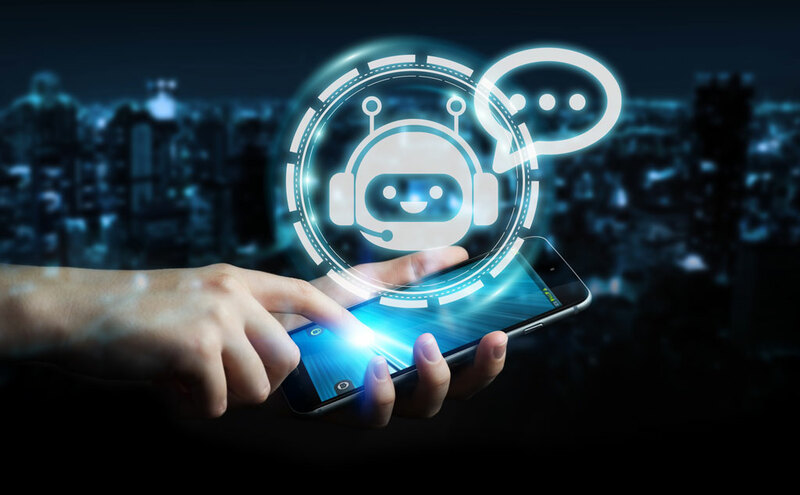 Chatbots for big business can handle thousands of queries at once, reducing the load on your staff and allowing them to deal with the major issues that customers face. They can also be updated instantly with changes in policy, new information or advice, allowing them to stay on top of a situation. That’s ideal for when a company gets hit with a crisis or a dynamic situation and is being inundated with requests for help. Charities, mental health organisations and other groups are fast finding that people often just want someone, anyone, to talk to. And since trained professionals are thin on the ground, a chatbot is picking up the slack to help people with a problem cope. The advice given might be nothing different to that found on a website or health brochure, but even feeling like they are talking to someone, can give anyone with a problem a sense of hope. Also, bots are becoming better at deeper conversations and will soon be good at assessing emotional states to help provide better advice and escalate urgent cases to get immediate care. While your typical brand might not need such features, there will come a time when most businesses or government branches, such as utilities and local government will benefit from sorting stressed or scared customers to get them the right help first. Have you ever clicked on a chat help message, expecting an instant response? Many businesses still have agents operating these features and the delay in response can be just as bad as the phone help line. 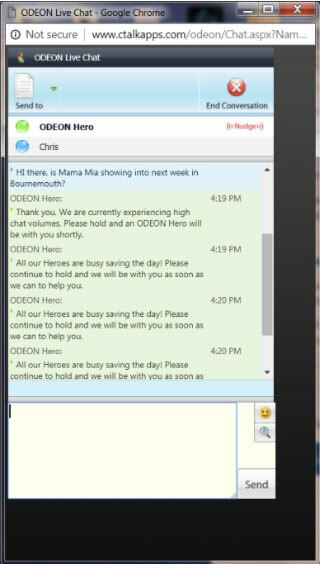 This example, a quick check typical during the summer holidays, should have taken seconds to resolve, instead it took 15 minutes for an Odeon agent to reply. If replaced by a chatbot, we’d have been done and dusted within seconds and that’s one of the main benefits of the technology. Not only will the bot help outside of business operating hours, they can answer common queries quickly and save your agent’s time for the serious issues. With the 9-to-5 era a distant memory to most, your business needs to be able to respond fast, and for a global business there is never a time when you should be closed for business. The technology world is always evolving and shaping the activities of users. The latest tidal shift sees people more used to working in Messenger Apps, or the likes of WeChat or LINE in different parts of the world. These services provide live chat with friends and increasingly chatbot interactions with business and brands. 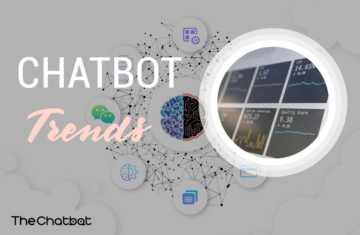 As the younger generations become used to these platforms as their de facto method of communication, they will expect chatbots to be available for any service they use. Phone providers, banks, sports teams and even their local hangouts will all need to be bot-enabled to talk to their clients, customers and fans. With many businesses looking to the global marketplace, the ability of a chatbot to converse in multiple languages will be a key part of the businesses’ ability to attract clients and engage around the world. Also, as people get used to talking to virtual assistants, there are some cases where chatbots will be better off actually talking to people and platforms like SnatchBot are deploying this technology now, so when it is appropriate (i.e., personal) people can type and keep their conversation private, while in other cases, it may be easier to chat to the bot. This also means bots will soon be appearing on Amazon Echo and Apple Siri boxes allowing customer support and other conversations to take place without a screen. Whatever the reason, as technology moves away keyboards and even screens, having a bot that is flexible and friendly is the way for most businesses to go.